12/18/2009 The car gets picked up TOMORROW! 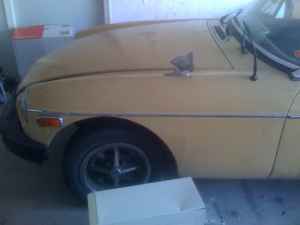 These are the pictures of the car that I saw when I found it on Craigslist. 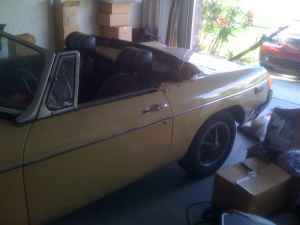 You are looking at a 1976 MGB. As it sits, the car is not running. I bought it about a year ago as a project car. Unfortunately, I never got a chance to work on it. I bought the car and it was not running. It was sitting in a guys garage for a year or so. When I got it home, I worked on it for a bit and got it coughing and sputtering. It ran for a few minutes before I noticed that gas was dumping out of the carbeurator onto the heat shield. At that point, I stopped working on it and ordered parts. I bought a new battery, points, condenser, plugs, wires, distributer cap, rotor, and carb rebuild kits. The parts alone cost me over $300.00. I also bought an MG Electrical manual for $75.00, which I will include in the sale. It should not cost any more to get it running. I removed the carbs with the intention of rebuilding them, but never got to it. The car is taking up space in my garage that I desperately need. The body is sound but does have some rust. The unibody is in good condition and is not rusted in any support areas. There are holes in the floor pans that have been patched. Overall, the car is in good condition for a car of it's age. I used to restore old British sports cars for a living. I have worked on many old MGs, Triumphs, and Jaguars. The reason I gought it was because it was in good condition and I knew it could be fixed and on the road in no time. My loss is your gain. The first $1000.00 takes it! I had it on Craigslist several months ago and was asking $1500.00. I had a buyer so I removed the post. The sale fell through because the buyer decided that he did not want to haul the car all the way to Fort Myers. If you have any questions, feel free to ask. I am located in West Boca. If you would like to come see the car, please email me and I will get back to you right away. The car is sitting in my garage on dollys and it is easy to roll around. I will include the dollys with the car as well.